CADR Ratings – What Does it Stand for? If you’re familiar with my website, you will already be aware that I’ve done my best to offer you reviews on some of the air purifiers I think are worth further consideration. You will also know I’ve done my best to make sure you can find out answers to questions you may have without having to “hunt” around the internet. This page is no different and in it, I intend to deal with the term CADR. What Does CADR Stand for? CADR stands for Clean Air Delivery Rate which is used to describe an air filter’s ability to remove all pollutant particles and is expressed in cubic feet per minute. What can be confusing is the fact that air purifying filters are not all created equal, which is why CADR ratings vary. What you do need to know however, is there should ALWAYS be three figures: one for dust, pollen, and one for smoke. 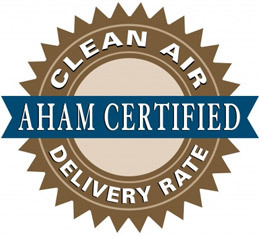 In order to establish some sort of standard for all air purifiers, AHAM (Association of Home Appliance Manufacturers) came up with the CADR ratings. One thing I must point out is that CADR ratings are never given out for whole-house air purifiers because they’re measured differently to portable units. You should also know that organizations like the EPA rely heavily on the ratings handed out by AHAM, so they’re highly dependable. The CADR rating on each air purifier can be found on the AHAM seal which shows all three numbers for smoke, pollen, and dust respectively. Of course, the higher the number the more air is filtered by the unit. Since smoke particles are the smallest in diameter (ranging from 0.09 to 1 micron), the number for smoke is always the first one listed. The CADR numbers for dust whose particles range from 0.5 to 3 microns, and pollen with particle sizes ranging from 5-11 microns follow suit. For example, the CADR numbers for the IQAir® New Edition HealthPro Plus are 450 for smoke, 450 for pollen and 450 for dust. Based on the recommendation by AHAM these filters should be used in rooms whose volumes, expressed in cubic feet are equal or smaller than the filter’s CADR rating multiplied by 12. I really could go all technical on you now, because there are more complicated equations that help to really tie down exactly what level of CADR you should look for. However, I don’t want to send you to sleep! Instead, along with the rating you should also be able to find what size room your chosen purifier can adequately deal with. I know this may not have been the most interesting of reads but it’s worth knowing how these ratings are determined, and how much of a role they play in your selection of the right air purifier. Once you have a good grasp on this, consider yourself an expert on the subject!